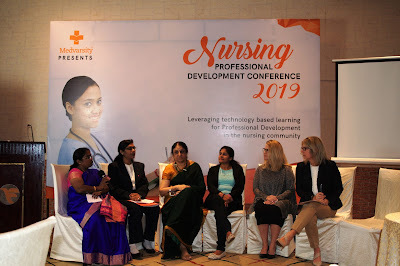 The panel discussion which followed after the informative sessions by various esteemed dignitaries brought to light the challenges in the Nursing profession/education and how technological advancements can assist in overcoming these. Speakers like Ms. Michele Steinbeck (Director of Nursing for International & Provider Markets, Ascent Learning/ATI Nursing Education), Dr. Kristi Gearhart Burgess (Client Executive for International & Provider Markets, Ascent Learning/ATI Nursing Education), Col. Saravjeet Kaur (Nursing Director, Apollo Hospitals, Hyderabad), Dr. Sriharsha A. Achar (Group chief Human Resources Officer, Apollo Hospitals Group), Dr. Vasundhara (Principal, Apollo Nursing College), Ms. Sonymol (GM Nursing, Continental Hospital, Hyderabad) and Ms. Tessy Augustine (GM Nursing, Maxcure Hospitals, Hyderabad) spoke about the latest innovations in nursing. The session included discussions on the empowerment strategies, leadership roles, healthcare transformation, entrepreneurial avenues and reflection of nursing as a science in order to help upskill the community, as a whole.